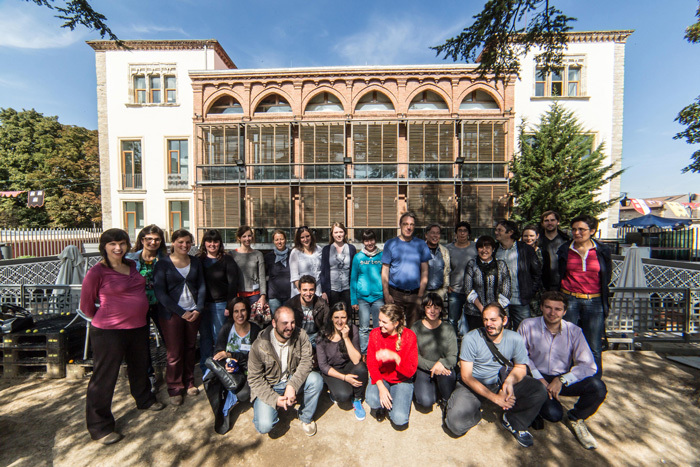 Between 2012 and 2016 COST Action Urban Agriculture has organised five Training Schools that were addressed mainly to Early Carreer Researchers and Master students. The Training Schools developped different approaches to Urban Agriculture through lectures, field trips and place-based planning and design tasks solved by the Trainees in Workshops. The Training School was organised by Prof. Gerassimos Arapis at the Agricultural University of Athens. Training School "Urban Food Production"
The Joint Training School with COST Action "Urban Allotment Gardens" took place in Ljubljana (Slovenia) from 21st to 24th of October 2014. Ljubljana Joint Training School on Urban Food Production was organized by Urban Planning Institute of the Republic of Slovenia together with the COST Actions TU1201 (Urban Allotment Gardens) and TD1106 (Urban Agriculture Europe). It was arranged for Students (at master or PhD level) and early stage researchers (who are in the early phase of their career with at least PhD degree and not more than 8 year work experience after graduation). The joint training school has linked knowledge, work and experience gathered from two COST Actions considering urban food production. All students actively participated in 9 workshops on different research areas (planning and policy, sociology, ecology, urban design): Walk Through Urban Gardens, Understanding Ecological Food Growing, Understanding the Site, Environmental Aspects of Urban Food Production, Social Aspects of Urban Food Production, Economic Aspects of Urban Food Production, Comprehensive Development of Urban Food Production, Designing Urban Food Production?, Designing Planning Processes for Urban Food Production, Different Levels of Governance Regimes and Policies. 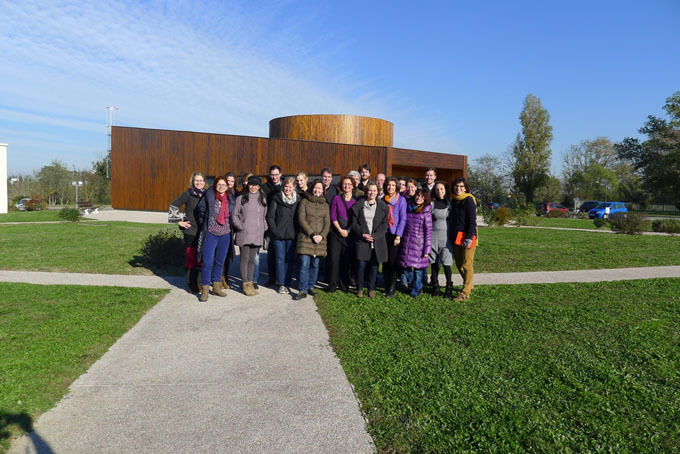 Training School "Urban Agriculture inside the city: alternatives for vacant lots and public space"
The third Training School of the Action took place in Vitoria-Gasteiz (Basque country, Spain) from 24th to 26th September 2014. Vitoria-Gateiz has experimented an important urban outgrowth in the last decade, mainly through the planning and development of two new neighborhoods, Zabalgana and Salburúa, situated at the eastern and western border of the city, by the Greenbelt. These new development are well-equipped and designed according to sustainability principles. Nevertheless, among the main problems they present is their over-dimensioned public space, which creates some areas lacking enough density and mix of uses. On the other hand it is very expensive for the municipality to maintain these public space with the high Vitorian urban standards for public space. The proposed solution for this problem is a strategy of "re-densification" through the insertion of new uses The debate has arisen about which are the most adequate uses to insert in order to get an increasing of urban vitality, specially considering that housing has reached its peak and that Vitoria-Gasteiz is well served with social and sport amenities. The main goal of the TS was to offer an opportunity for the reflection about how urban agriculture might be an optimal alternative for the re-qualifying of this over-dimensioned public space in the new neighbourhoods, especially considering it synergic potential as a tool for production, leisure and landscaping, including the possibility of energy crops within the limits of urban space. Continuity with rural and natural surrounding area through alternatives for urban fringe at the small scale is a relevant issue to be considered as well within the reflection. Taking Zabalgana neighbourhood as a practical field for experiment, the Training School is conceived as a practical and intensive design charrette to be held during a whole day after two days of local knowledge-deepening through field visits and presentations. COST UAE Training School, Toulouse 25-28/11/2013. The aim of this training school was to give a better understanding and discuss the links between farming and city, through the interactions between activities, spaces, and public policies at a metropolitan scale. In any cases, it supposes the coordination of different actors in order to develop a shared vision of the presence and the sense of productive activities within and near the city, and to develop collective actions. to contribute to the work of WG2 and WG4 of COST action – Urban agriculture in Europe (UAE), by exploring the integration of agricultural issues into governance aspects and spatial visions. 9 french guest students helped for organizational support of the event from Master 2 level specialization “Agro-Resources and Environmental Management” (AREM) of EI Purpan where. A total of 17 trainees from 9 UE countries have participated. The first day was dedicated to formal presentations, explaining the Toulouse case study and institutional organization focusing on the peculiarities of French urban planning policies. During the afternoon a round table with 4 local stakeholders as project managers (Urban Agency of Urban Community of Toulouse Metropole) and agricultural institutions (Board of Agriculture, Regional Direction for Alimentation Agriculture and Forest), have been organized. The stakeholders presented their vision of periurban farming in such an urban context and their profesionnal activities in relation to this issue. The second day consisted of a field trip, where we interviewed 5 different periurban farmers: an important traditional crop grower who is also a farm contractor (at 15 km from the center of Toulouse), a recent installed owner of a small farm inn where we had lunch (about 35 km from center of Toulouse), a poultry producer who’s farm got circled by urbanization at 30 km from center of Toulouse, an organic cereal producer and miller in direct selling (25 km from center of Toulouse) and a vegetable producer supplying a CSA (the farm in located at about 65 km and the selling point is at 25 km from center of Toulouse). We also met the mayor and the municipal councillor in charge of Urbanism of Pin-Balma where a projet of an “agricultural park” is in elaboration. On the third day, took place the participative and collaborative experience, called the “Territorial Game”, where a territorial diagnosis with scenarios and proposals of actions got elaborated by the participants in pluri-disciplinary sub-groups. This was specially coordinated by Sylvie Lardon. and the participants had to combine the collected information (datas, maps, inteviews of stakeholders and farmers…) of the two precedent days This itinerary permitted to experience the diversity of opinions and visions, to gather this diversity and to produce collectively a shared vision of the territory. At every step, a collective document (diagnosis, scenarios and actions) was produced. At the end of the day, the trainees were able to make a presentation of this work and to discuss it with 3 local other stakeholders (from the Commununity of Agglomeration of Sicoval, the Regional Association of the Councils for Architecture, Urbanism and Environment, and a farmer & municipal councillor). The last day permitted to elaborate a leaflet resuming these results and that will be distributed (to the different institutions, stakeholders, farmers and other participants that got involved in the Training School) and to the Cost Action-UAE by the end of 2013. We closed the training school by a debriefingof the event that evaluated the satisfaction and expectation of participants. Overall, the trainees were mainly satisfied with the collective work, with a very good group dynamics. They acquired a practical knowledge of agriculture in the Toulouse area, even though the time period was very short. Methodological contributions were appreciated, even if the presentation to the local actors did not allow deepening the territorial issues. All trainers and trainees are left delighted by this convivial moment of collective production. Why do people take part in urban agriculture? / What benefits do they perceive? / What motivates urban gardeners? The goal of the training school is to give the participants a better understanding of UA from the participating gardeners' perspective. Policies for UA must no doubt take the participants' perspective as a starting point. To work with, not against, the participants' interests is probably a success factor. Malmoe has a great variety of urban agriculture initiative, top-down initiatives as well as bottom-up. It has also a variety of examples of sustainable urban development initiatives. The city was one of the few invited cities to the exhibition of sustainable urban development at the World Expo 2010 in Shanghai. From the city' point of view UA is one of several paths that lead to sustainable urban development. Some of the urban gardeners might agree upon that, but others have more specific motives. There is not just one type of urban gardener. Why do people take part in urban agriculture? What benefits do they perceive? What motivates urban gardeners? These are the questions that the training school is going to deal with. Each participant is expected to write a short paper on a case they have knowledge of. The paper shall deal with at least one of the questions above. The papers shall be sent in beforehand and be presented and discussed at a paper session the last day. After the training school each participant is expected to write a short paper either comparing the papers that has been presented or expanding their own papers with the theories and empirical observations they have done during the training school.